The burden of teaching new players shouldn't always fall to their friends. League of Legends has achieved a lot over its tenure as a game. Riot have successfully turned their indie effort with server issues and clunky models into a global phenomenon. There are still a few problems to address, some of which have Riot’s attention (lack of replays, sandbox mode), and others which are yet to be addressed. One issue is massive enough to have gained Riot’s attention, but it hasn’t been answered in any real form yet. That issue is the hurdle new players face in starting the game. While there have been minor adjustments over the years, such as the IP cost for older champions dropping upon new releases or the new and in-depth champion classification system, these small tweaks aren’t enough to lower the massive hurdle that new players face. While this issue comes up again and again on Reddit, the official forums and Twitter, it still doesn’t seem to have registered with Riot just how vital finding a solution is. There are 134 champions in League of Legends, as of Camille. Each champion has five abilities (four actives and a passive), base stats and an arc of growth, potential item builds, and more that determine their ‘best-case’ role. For instance, Ekko was originally released as a mid lane assassin, but his kit and stats made him a top lane bruiser. New players are expected to learn all of this. Sure, there’s the free rotation that makes it slightly less intimidating, as they can only pick up ten champions at a time... but there’s still a massive pool of knowledge that players need to pick up, and playing doesn’t teach them enough, fast enough. Players are thrown into the deep end after a brief tutorial. Who’s this knifecat? Why did he just one shot me? Add in the snowball nature of League, and what should be a fun game turns into a nightmare track as a 20/0/4 Yasuo rips through a new player’s team again and again. 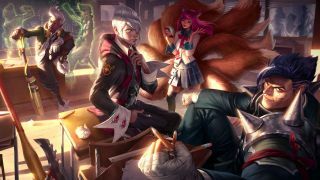 The tutorial is meant to be the answer to many of the above complaints, but when faced with the massive task of helping players grapple with the task of understanding League of Legends, it falls short. The tutorial goes over the basics of the game: controlling your champion, killing minions, levelling skills, returning to base, spending gold, turrets, and more. Battle Training, the new tutorial, is significantly better and aimed at allowing a player to jump into a game of League. No longer are players forced to deal with a simple tutorial with Thornmail Ashe being their only option. Add in the fact that the average passive has changed from one or two lines to massive tomes, and it’s easy to see how a new player can get lost and confused. Confused players don’t have fun, and players who aren’t having fun don’t want to play League of Legends. The above might be forgivable, as it’s a long road from 1-30. Presumably, a new player can slog through vs. AI games, get their bearings, graduate to playing against real people, and eventually find their footing. The problem is that very few people have the gumption to submit to such a long and arduous learning process, especially when smurfs plague lower levels. Even when they stick to it, there’s no in-game way to learn about what red buff is, or when you should take it. No one explain when a bad baron call is, or what junglers can apply lane pressure. Well, someone often does step up and explain this—the friends of the new player. Eager to have a new buddy to queue up, new players join a game. They explain jungle positioning, lane matchups, warding, dragons and barons, and more. That’s the problem: low level games become a classroom. Other players have to deal with the smurf in the game playing tutor, and the veteran has to teach their friend. It isn’t an ideal situation for anyone. When a game is as vast and enormous as League, it’s hard to have an encompassing tutorial that covers every scenario. It becomes clear that there has to be some kind of ongoing solution for training new players. There are a few angles League could take, each with their own pros and cons. Quests: Heroes of the Storm offers a quest system. When you log in, you get daily quests that offer bonuses for goals like completing three games as a ‘Warrior’ or a Starcraft hero. Players are incentivized to try new heroes. A League quest system could offer bonuses for players who constantly test themselves. Mentors: What if players could volunteer to help a new player, and were granted in-game rewards for every game they played with a newbie? Tiered tutorials: The current battle tutorial works for the basics, but what about a jungle tutorial? A top tutorial? A zoning tutorial? There are plenty of bite sized chunks of the game that could be explained in-game, as opposed to having the player desperately search for YouTube videos. The reason why Riot has yet to feel any real, noticeable ramifications of their lacking tutorial system is often because existing players step up to shoulder that burden. There’s a better way. Now that there’s a new, spruced up client, hopefully we’ll see ways for new players to understand League following in its tracks. After all, there should be room for complex, layered games. There just needs to be a way to figure them out without plunging yourself into the deep end.